The provisions of the EPBC Act and Regulations apply to all Commonwealth reserves, so many of the rules and regulations at HIMI are similar to those in the Kakadu, Booderee, Norfolk Island and other Commonwealth national parks. What do I eat? Ice fish (lots of it), and some squid. What eats me? Orcas and perhaps leopard seals when at sea; eggs and chicks are eaten by skuas and giant petrels. Range trip time: 3 days to 3 weeks depending on breeding stage. Range trip length: varies with breeding stage from 600 – >2500 km. Depth of water where foraging: 200 – 4000 m but in summer king penguins dive mainly to depths of around 50 – 120 m, and in winter to 150 – 240 m.
Extreme dive depth/time: 300 m / ~8 minutes. 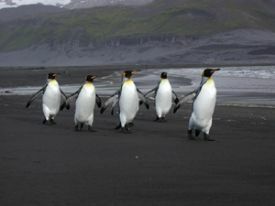 Distribution: King penguins breed on most subantarctic islands in the Southern Ocean, including South Georgia, Marion, Prince Edward, Crozet, Kerguelen, Heard, Macquarie and the Falkland Islands. Abundance: Very difficult to estimate population sizes at large colonies: South Georgia, Îles Crozet and Macquarie Islands have several hundred thousands pairs. Almost all breeding populations are increasing. Most Heard Island king penguins breed at the southeastern end of the island. The largest colony is at Doppler Hill, numbering more than 25,000 breeding pairs. A smaller colony is present at Spit Bay, with about 1500 pairs.